With my trusty steel workers hard at work yesterday, I knew I wouldn't get anything done that required my full attention, instead I did something I hadn't done in a while: Mow the lawn. 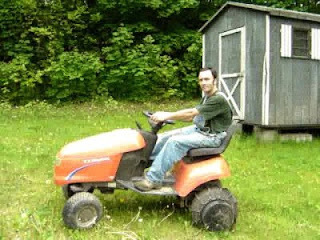 With all the rain lately and the warming temperatures, all the grass had been growing like crazy, and I had a hard time with our push mower, though self-propelled. At the end of the day I had it, I needed something bigger. 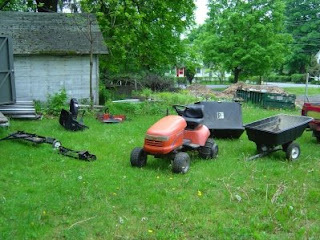 I went on Craig's List and looked around what's for sale, and lo and behold only ten minutes away someone was selling a lawn tractor with all sorts of attachments, thatcher, lawn sweeper, wagon, and snow thrower. All these things will come in handy for property maintenance. To make it short, I went there, I saw, I lusted. Today we picked it up (thank you Jody for lending us your trailer, and trailer pulling car, and you, trailer pulling car driver). Aside from that I started plastering the second bathroom. I started on the ceiling, because E! was still painting the baseboards and trim, which she finished today.